Beautiful 1955-56 MLW Ginny with platinum blonde flip, soft rosy cheeks, blue eyes and molded lashes that open and close easily. Minty, clean condition with working walker. Ginny is wearing a navy variation of the Merry Moppets #35 cotton dress with white bodice and red striped ribbon self belt. The dress is tagged with a minty Medford Mass. tag. Matching navy bloomers, vintage rayon socks and marked red flat-bottom Ginny shoes. 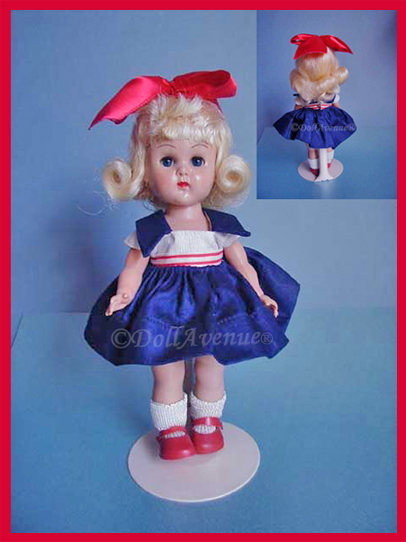 Cute reproduction red bow completes this beautiful vintage doll and outfit. Please email with any questions.